JAMBO! 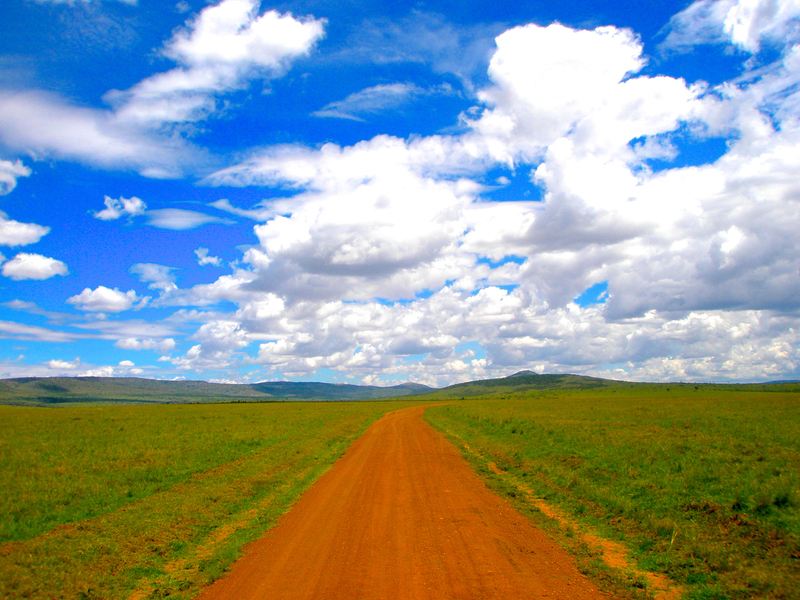 Welcome to the Maasai Mara! 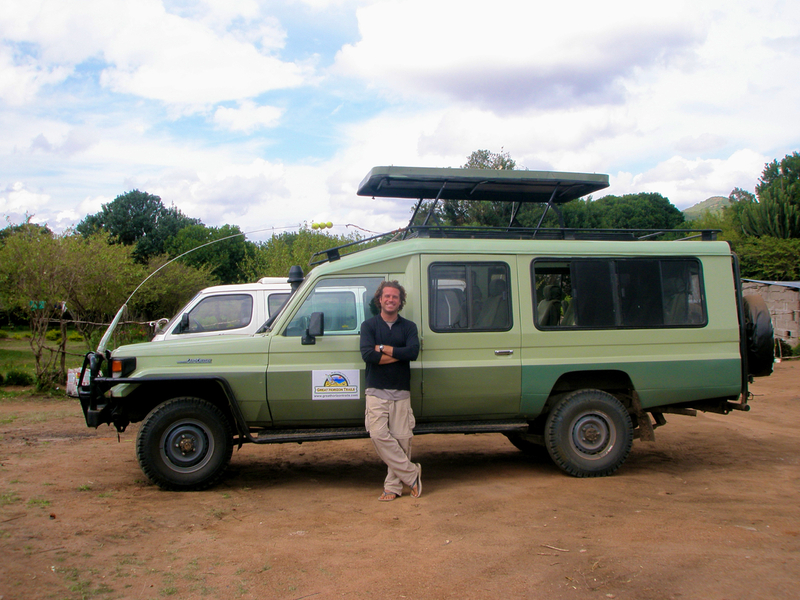 We met our guides and the safari vehicles at what was the African equivalent of a road-side truck stop- a small market, a restaurant, and, of course, a little souvenir shop with grossly over-priced African trinkets. We bought a few snacks and stock up on bottled water before piling into the converted land cruisers, and then were on the road towards the park. It was a long trip into the Mara- about 4 hours of bumping along the pot-holed highway and navigating dirt roads through rural villages. 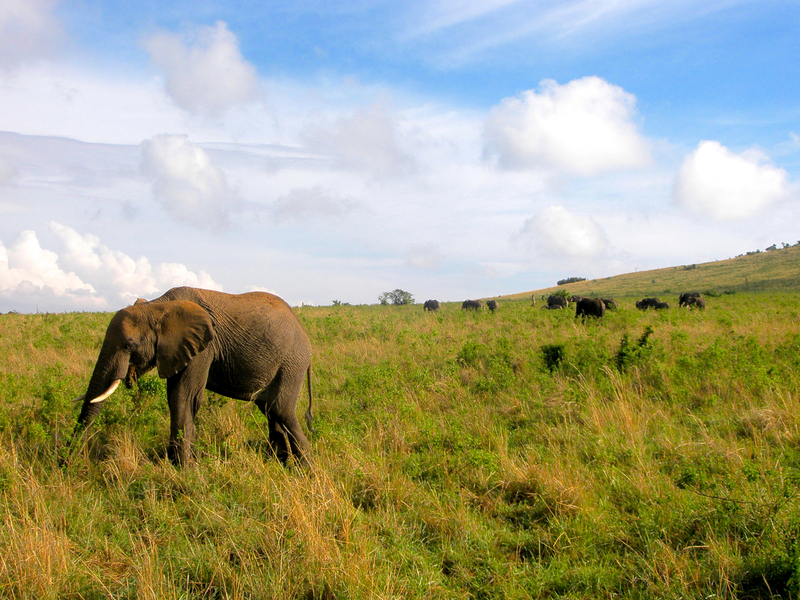 Eventually, we found ourselves cruising along in the open African wilderness, off the tarmac and surrounded by rolling green hills and endless grasslands. We wound our way along the dirt track, all of us keeping a keen eye out for any signs of wildlife. We knew we weren’t actually IN the park yet, but still, you never know whats going to happen in the African Wild. 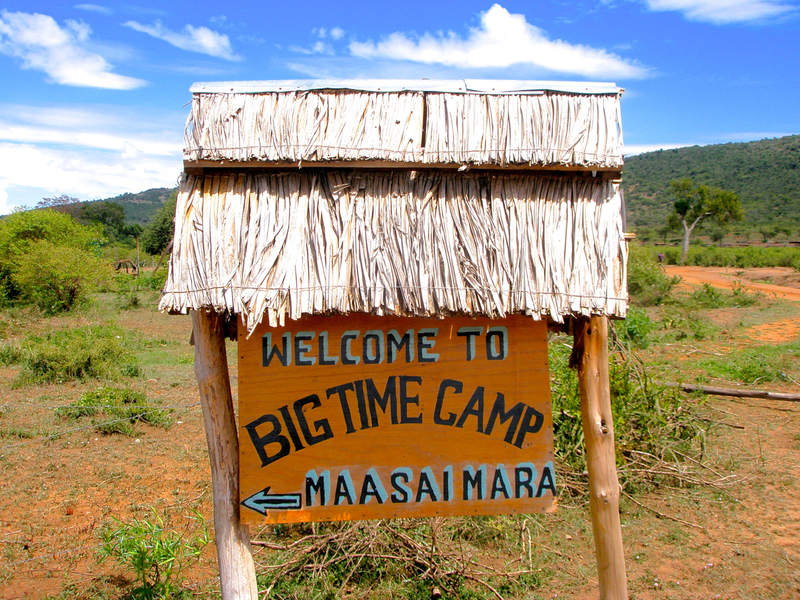 Finally, we pulled off the dusty road and into our campsite- the BigTime Camp, just outside the gates of the Maasai Mara. A quick stop to drop our bags, and then we were off to see what the locals were up to, excited to start exploring one of the top game reserves in the world. It suffices to say that the Maasai Mara lived up to its reputation and then some over the next 48 hours. We were fortunate to have ideal weather conditions while on safari in the Mara, the bright yellow sun peeking in and out from behind billowing clouds in a seemingly endless African sky. It was the perfect backdrop for witnessing the ins and outs of the animals’ daily routines within the reserve. The first morning, just after entering the park, we came across a large group of giraffes, seemingly as interested in us as we were in them. Giraffes are hilarious- they are so cautious and wary of anything and everything around them, constantly keeping a sharp eye out for predators from their high vantage point. They move very purposefully, taking a few steps and then stopping, looking this way and that, surveying the scene before moving on, only to take a few more steps and then stop again, craning their necks to look around in all directions. Their odd body, awkward movements, and unique color patterns just add another dimension to their paranoid demeanor, and all combine for great entertainment, thats for sure. 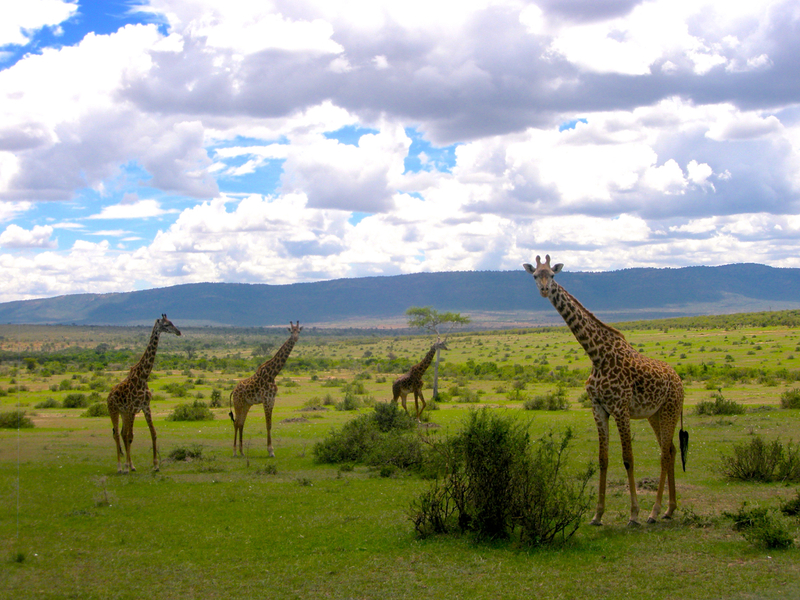 They are the towering sentinels of the savannah. 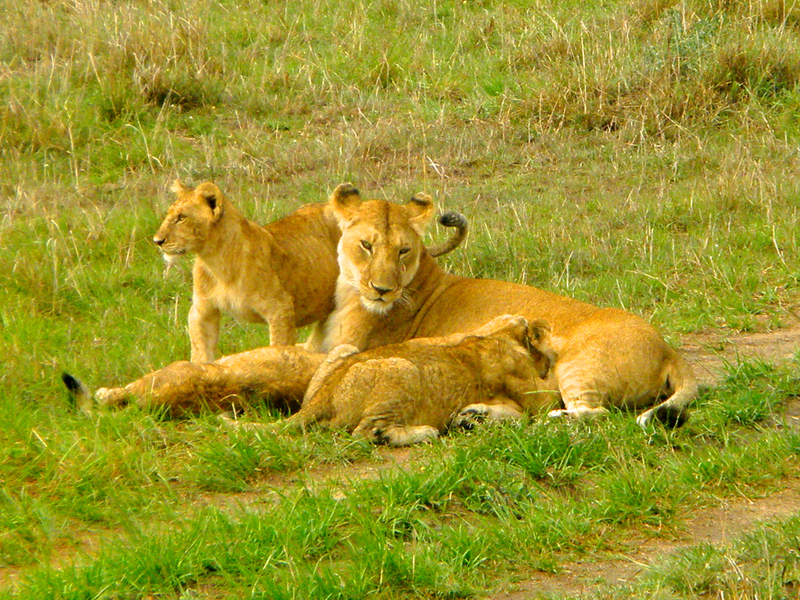 The Maasai Mara is actually just an extension of the famous Serengeti Plain- the part that reaches north from Tanzania into Kenya. 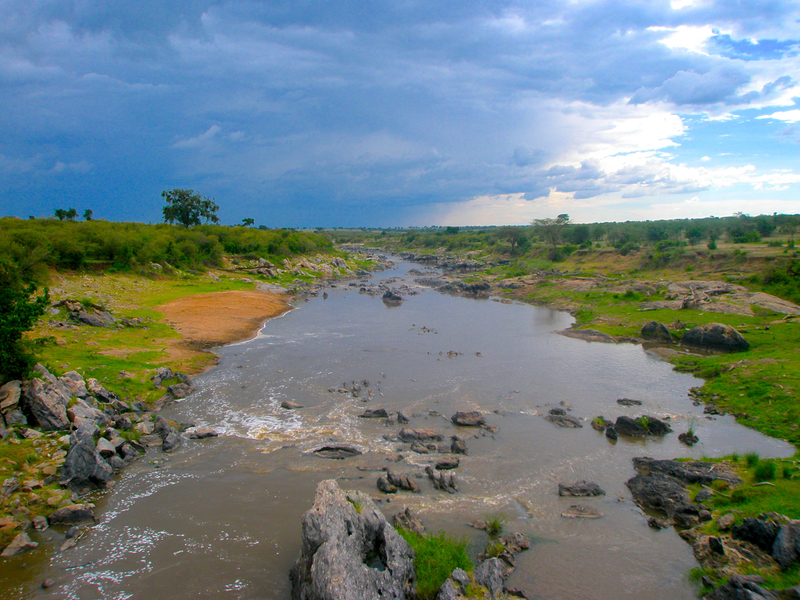 Thus, the landscape was very similar to that which we saw in Tanzania, but it seemed the varying habitats were more closely gathered than on the vast plains further south. Here in the Mara, you’d have an expanse of open grassland divided by a stream, trees towering above- an ideal place for a leopard hide out. Rocky outcropping and steeply sloped hills provided cover for both predators as well as prey, and this varying landscape made it easy to find herds of wildebeest and antelope out in the open one minute, and then come across some of the shyer animals up in the trees and shrubs the next. As usual, our guide was on the radio constantly, getting info and tips from the other guides spread throughout the park. Because of this, there were often 4, 6, 8, even ten trucks assembled when something special or unique was spotted. It quickly became apparent that you could tell something was going on from miles away- all you had to do was look for a spot where several safari vehicles were gathered together. While this made it easier to find some of the stealthier animals, it could also cause a traffic jam with so many trucks crowding around the same site, each driver trying to get their crew in the best viewing position. Every truck wold take their turn, snap their photos, and then try to move out of the way without causing too much of a commotion. So it goes with most game drives, I suppose. Regardless, the Maasai Mara was the epitome of an African game reserve, and probably the best wildlife viewing we had during the entire 70 day trip. We were able to get SO CLOSE to many of the animals- buffalo, giraffes, elephants, leopards, the herds of zebra, antelope, and wildebeest- they all were RIGHT THERE. At one point, our driver got us no more than 5 meters away from a MASSIVE male lion, who seemed content for us to take as many photos as we wanted. We noticed that there was a female nearby, and our driver noted that the male was letting us get so close because he was exhausted. “From what?” we asked. He just smiled and laughed. “Ohhhhhh- riiiight…” Good on that male lion! The Maasai Mara IS: Huge herds of buffalo spread across a lush hillside, noisily munching on the greenest of grass; Families of elephants trolling along, one after the other, the matriarchs making sure they are always between the little ones and any nearby threats; Prides of lions 20+ strong, holding court over a virtual ‘Lion Day Care Center’, cubs wrestling and playing with each other while their mothers keep watch for danger; a leopard lolling lazily in the trees, limbs splayed comfortably over a wide branch, a tiny flick of its dangling tail the only sign that it is there at all; groups of stately giraffes, warily surveying the landscape for any signs of predators; vultures and hawks continually circling in the skies above, on constant vigil for the next available meal; the rhythms of fight vs. flight, predator vs. prey, life vs. death playing out in a daily drama that defies imagination. 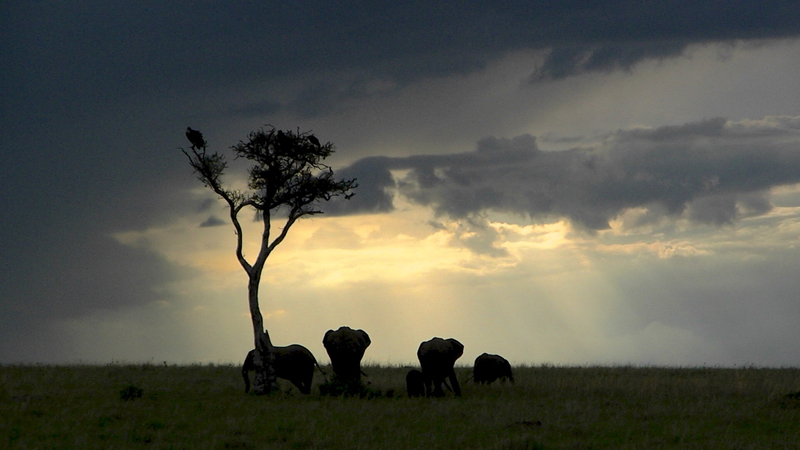 Huge skies and endless adventure- this IS the Maasai Mara!